Indian chef Saransh Goila, founder-owner of Goila Butter Chicken is all set to make an appearance on Master Chef Australia, as a judge. The globally-acclaimed show, which is currently running its 10 year anniversary special season, invited Goila as a guest judge for an episode earlier this year. The episode will air in India in September, 2018. For the show, Saransh Goila asks the contestants to recreate the recipe of his signature Goila Butter Chicken, a take on the iconic dish butter chicken that is now a flagship of Indian/Mughlai cuisine around the world. The season will also feature celebrities like Prince Charles and culinary maestros like Gordon Ramsay and Nigella Lawson. 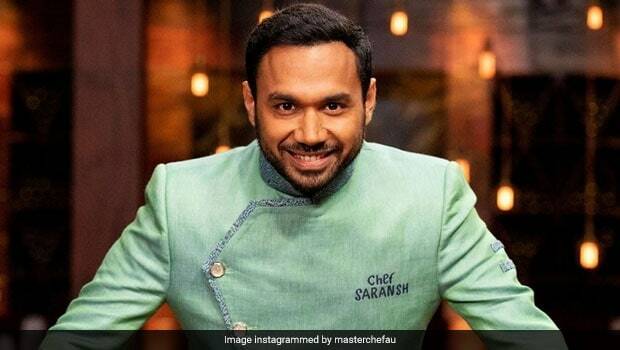 As seen in the videos shared by the makers of the show, Chef Saransh Goila will make Masterchef Asutralia contestants re-create his butter chicken recipe for an intense elimination challenge, and the young chef is especially excited for the episode to air in the country. Talking about his experience as a judge on one of the biggest cooking reality shows in the world, he told us, "It was like a pressure test for me also, not just the contestants, because I was representing my country. I needed to make sure that I spoke well and that I put my best foot forward. I needed to make sure I represent our cuisine well and that my food tasted up to the mark." Talking about how he went about showcasing the butter chicken recipe for contestants to re-create, Saransh said that it wasn't all that easy. "I had to test my recipe four times in the Masterchef Australia kitchen before it made it to the episode and was shared with the contestants for the final challenge", he said, adding, "Everyone was surprised to know that it's not simply a dish put together using tomatoes, cream and butter, and that my version uses old-school techniques and an interesting blend of spices." His Goila Butter Chicken has impressed non-vegetarian food lovers all over the country and it had a similar impact on Masterchef Australia judge Chef George Calombaris last year when he was in India. Chef Goila had met with Chef Calombaris in 2017 and had made him sample his butter chicken recipe, which the delighted chef had labelled as the "Best Butter Chicken Chef In The World!" Saransh Goila was consequently invited to host a pop-up as part of the Melbourne Food and Wine Festival in March 2018. After filming the episode with Saransh Goila, Chef Calombaris even gave Chef Goila a shoutout on his Instagram page by uploading a picture with him and saying, "A great chef and even more, a great guy, Saransh Goila. All the way from Mumbai." Apart from managing his restaurant, Saransh also hosts two food shows on Food Food channel and has also authored a book by the title India on my Platter. Butter Chicken Lasagna, Anyone? Head To Connaught Place To Savour This Delight! Chef Gordon Ramsay Posts Pic Of Butter Chicken From His Restaurant: Twitter Attempts To Roast Him In His Own Style!